Vous n'aurez qu'a vous rappeler d'un seul mot de passe! L'offre gratuite du jour pour Sticky Password Premium 8.0.9 (Win&Mac) était valable le 11 octobre 2016! Sticky Password Premium est un gestionnaire de mots de passe primé et remplisseur de format qui vous rappel de vos mots de passes et les entrent automatiquement si besoin - sur votre desktop, smartphone, ou tablette. Gardez tous vos mots de passe en un lieu sécurisé crypté par AES-256. Votre mot de passe principal sera la clé pour débloquer le stockage de vos mots de passe - vous seul l'aura! La technologie Sticky Password est reconnue par de million de personnes dans le monde. En plus de Windows, Sticky Password est aussi disponible sur Mac, Android et iOS avec meilleurs options de synchronisations contrôlées par vous. Vous décidez comment synchroniser vos données sur tout vos ordinateurs, smartphones, et tablettes. Si vous préférez ne pas synchroniser via les serveur cloud bien sécurisé de Sticky Password, vous pouvez exploiter votre synchro Wi-Fi locale, qui synchronise vos donnes sur votre propre réseau et ne va jamais sur le cloud. Remarque: Ce logiciel vous donne une licence d'un an et est disponible seulement pour les nouveau utilisateur ou les anciens utilisateurs de GOTD (peut être activé jusqu'au 31.10.2016). Si vous êtes utilisateur de Mac, bien vouloir télécharger un fichier d'installation file ici (6.97 MB). Obtenez Sticky Password Premium (licence à vie) avec un rabais de 70%. Les utilisateurs de GOTD peuvent avoir le programme au prix de $44.99, au lieu de $149.99. Sticky Password was first featured here on January 4, 2007 and I never stopped using it ever since version 4 ! 1.You can create a portable version of SP from within the program. 2.You can configure SP to work on a portable version of your favorite browser. 5.And of course there's the outstanding support in case you can't figure things out. 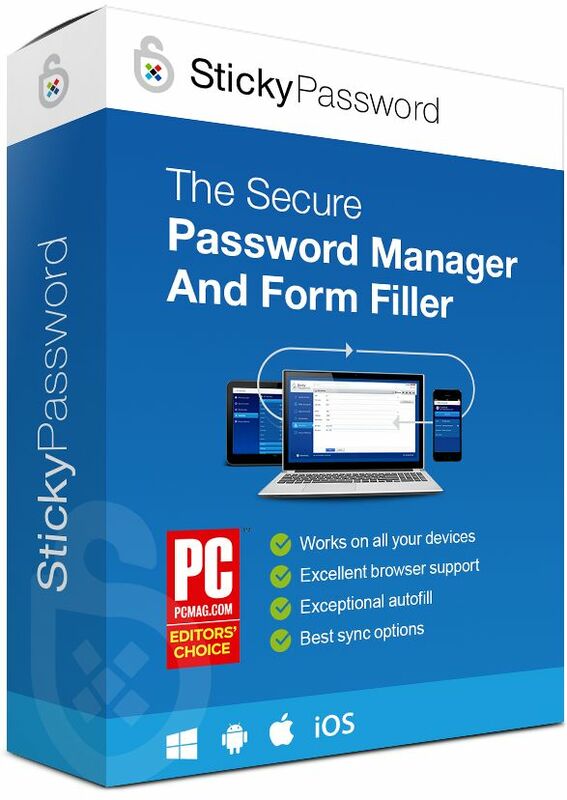 So..what are you waiting for to give Sticky Password a try ? Sticky Password was first featured here on January 4, 2007 and I never stopped using it ever since version 4 ! What I particularly like about SP : 1.You can create a <b> portable </b> version of SP from within the program. 2.You can configure SP to work on a portable version of your favorite browser. 3.Cloud sync is optional. 4.There's an option to add secure notes(memo's,licenses..) 5.And of course there's the outstanding support in case you can't figure things out. 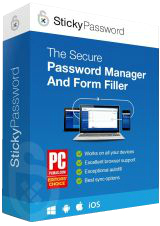 So..what are you waiting for to give Sticky Password a try ? Take care. Excellent programme! Have been using it for many years, both on my PCs as well on my Smartphone -- it syncs automatically via Wi-Fi, to include the most recent(ly entered) change. Next to its functionality in filling log-ins and forms, has proven invaluable to me in storing Secure Memos. And... more importantly, when my computer broke down within a year – not to mention the Windows 10 Anniversary Update, which threw it out of its system (!) – I was able to easily re-set it up and running. Excellent programme! Have been using it for many years, both on my PCs as well on my Smartphone -- it syncs automatically via Wi-Fi, to include the most recent(ly entered) change. Next to its functionality in filling log-ins and forms, has proven invaluable to me in storing Secure Memos. And... more importantly, when my computer broke down within a year – not to mention the Windows 10 Anniversary Update, which threw it out of its system (!) – I was able to easily re-set it up and running. QUESTiON #1: I thought I had seen somewhere that I was entitled to a Free Version 8 Upgrade, is that correct? is that only for 1 Year at a time or Can I buy a Lifetime License? QUESTiON #2: I had always been hesitant about upgrading to version 8 because I understood it was an online or Cloud based program. 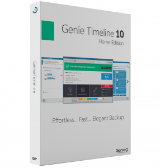 Can Version 8 be used like the previous versions (ie: without Cloud)? QUESTiON #3: I have never found a ChangeLog or Version Release History on your website in the past (so I never knew when the versions I owned were updated (because I prefer to do manual checking). Do you have now have a Version Release History Page that I can go too? QUESTiON #4: I have been lazy downloading Updated Releases and often to lazy to even use STiCKY (just relying on my memory). Do you have an archive for PAiD License owners, because I would like to download the Final Release of versions 5, 6 & 7. What advantage does it have over LastPass, that is lifetime free for PC? - Exceptional autofill. Captures even oddball logins. Manages also application passwords.